WataugaWatch: Can Women Scare Some Sense into Virginia? Yesterday's impromptu protest at the Virginia state capitol over several pieces of anti-woman legislation -- mandating an invasive "transvaginal ultrasound" for women seeking an abortion and a law declaring a fertilized egg a person -- is perhaps only the first wave of a tsunami of female (and male too) resistance to the conservative Republican theocracy that has taken over Virginia government. The protest was organized very suddenly and very quickly via Facebook and other social media. 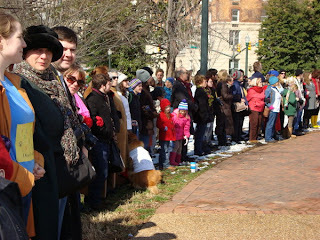 Over 1,000 mostly women stood in a silent queue that stretched nearly three blocks on a sidewalk. Later, they were allowed to flank both sides of the sidewalk taken by many state legislators to the Capitol, standing two and three deep. The protest seems to have shaken Republican self-confidence a wee bit, since the chief sponsor of the transvaginal ultrasound bill -- an alleged woman, incidentally -- opted to put off final consideration of her proposed law. Oh, for a minute there when I read the headline I thought maybe women were trying to scare some sense into OUR Virginia, the Madam herself. I remember when her car in the ASU parking lot had a bumpersticker saying ERA NOW. That was of course before she started kissing the Pope's toe and getting ambitious for public office, and also before she was fired (twice) as president over at Mayland Tech. May the women have some success in Richmond but I would dearly love to see such a demonstration here b/c The Madam's views are just as hostile to women's rights (she was for them before she was against them). Those women would know about scare tactics alright since they are using them to spread misinformation. This link will take you to the actual Va house bill 462 where you can read what the bill actually says and find out the truth not the spinning misinformed version put out by this and similar articles. Oh, riiight, Lynsker. It's such a good, reasonable, humanitarian bill that Gov.McDonnell can't back away from it fast enough. McDonnell went from being on everyone's short list of potential vice presidents to "Gov. Vaginal Probe." I would say his national ambitions just got a death notice because of all of this vaginal probing.